by francois on June 12, 2014 in Events, News, Ringu Tulku. 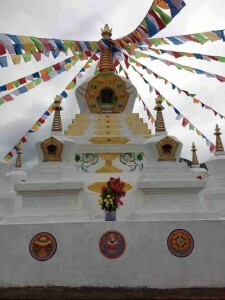 Tomorrow 13/6/14 on the auspicious day of Fullmoon of Saga Dawa my uncle Thendup Dorjee’s stupa will be consecrated by the Tulkus, Khenpos and monks of Rigul Monastery. It was built under the dedicated leadership of Dr. Chuga. I thank all who helped and contributed towards this project.